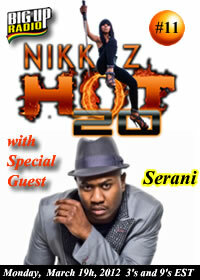 Join your host Diva Nikki Z as she interviews the talented reggae artist Serani on this weeks edition of the Nikki Z Hot 20 Countdown radio show. Serani is one of the hottest dancehall artists out today with a gang of smash hits under his belt. Find out all you need to know on this exclusive interview Monday, March 19th. Serani is a new Reggae artist that has taking Jamaica by a storm and is conituning to do so across the world. Serani born in the mean streets of Kingston Jamaica he decided at a young age that his two other best friends who also shared the same intrest in music decided to put together the informus DASECA productions in 2001. Three friends David Anthony Harrisingh, Crag Serani Marsh and Craig Andrew Harrisingh had a goal to produce all the major Reggae artist in Jamaica. Serani is quite a new artist on the Reggae Scene but he is blow up faster then Movado. Serani has co-produced the first two singles on Sean Paul’s new platinum album “Trinity,” including ‘We Be Burning,’ which was the first released single.